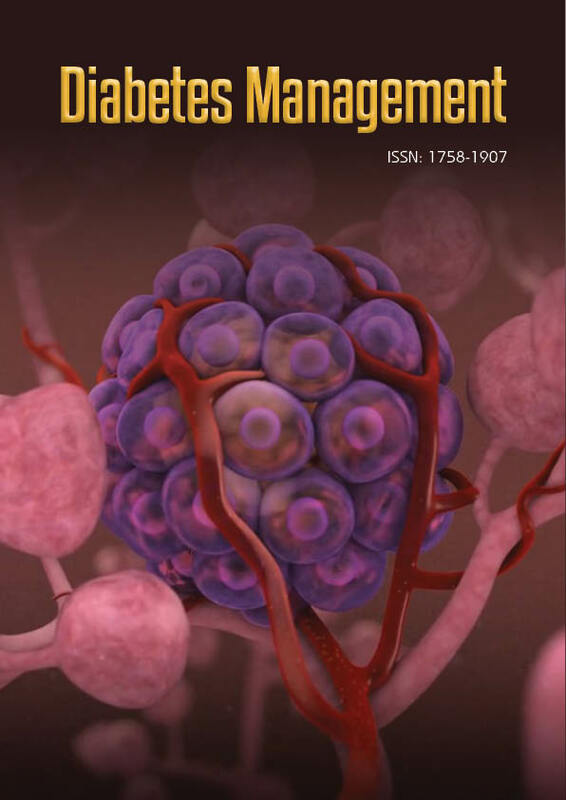 Diabetes Management publishes original research about the Physiology, Pathophysiology and Management of Diabetes. Submitted Manuscripts can report any aspect of laboratory, animal or human research regarding diabetes. Emphasis is on the investigative reports and opinions on areas such as management, pathogenesis, complications, normal and abnormal pancreatic islets functioning, pharmacological mechanisms of drug, insulin functionality, therapeutic and diagnostic approach to patients with Diabetes are published. Diabetes Management abides with the guidelines of ICMJE (International Committee of Medical Journal Editors). Only material that has not been published previously (either in print or electronically) and is not under consideration for publication elsewhere, with the exception of an abstract that is less than 400 words in length, will be considered for publication. All submissions to the journal will be scanned for possible duplicate or prior publication by using PlagScan. Authors who submit previously published work to the journal will be banned from submitting future manuscripts to the journal, and their funding body and/or institution will be notified. All contributions, including solicited perspectives on Diabetes, are critically reviewed by the editors and, if felt to be appropriate for the journal and potentially competitive, invited referees. Reviewers' comments, when available, are provided to authors. The exceptions are commentaries, all of which are by invitation only and reviewed only by the invited editor. The decision of the editors is final. Authors are welcome to suggest the names of individuals they consider qualified to serve as reviewers. Diabetes Management provides the rapid publication of articles in all areas of the subject which comes under the scope of Journal. Diabetes Management welcomes Submission of Papers that meet the criteria of significance, Area of Excellence and Scientific Knowledge. Papers will be published approximately One month after acceptance. In order to reduce delays, authors should adhere to the level, length and format of the Diabetes Management Journal at every stage of processing right from manuscript submission to each revision stage. Submitted articles should have a 250-300 words summary/abstract, separate from the main text. The summary should provide a brief account of the work by clearly stating the purpose of the study and the methodology adopted, highlighting major findings briefly. The text may contain a few short subheadings of no more than 40 characters each. Formats for Diabetes Management journal contributions: Diabetes Management accepts various forms of literary works such as Research Articles, Reviews, Abstracts, Addendums, Announcements, Article-Commentaries, Book Reviews, Rapid Communications, Letter to the Editor, Annual Meeting Abstracts, Conference Proceedings, Clinical Images, Calendars, Case-Reports, Meeting-Reports, News, Obituaries, Orations, Product Reviews, Hypotheses, Prospectives, Study Protocols and Drug Evaluations. Confirm that each individual named as an author meets the uniform requirements of the Journal for authorship. Number all sheets in succession, including references, tables, and figure legends. Title page is page 1. On the first page, type the running head (short title for top of each page), title (which cannot include any acronyms), names of the authors and their academic degrees, grants or other financial supporters of the study, address for correspondence and reprint requests, and corresponding author's telephone and fax numbers and e-mail address. Research Articles: Research articles are articles written based on the empirical/secondary data collected using a clearly defined research methodology, where conclusion/s is drawn from the analysis of the data collected. The information must be based on original research that adds to the body of knowledge in Diabetes. Article/s should provide a critical description or analysis of the data presented while adding new and rapidly evolving areas in the field. Include an abstract of maximum 300 words with 7 to 10 important keywords. The abstract should be divided into Objective, Methods, Results, and Conclusion. Research articles must adhere to a format constituting the introduction followed by a brief review of relevant literature, methodology applied (to collect the data), discussion and References, Tables, and Figure Legends. Review Articles: Review articles are written based mostly on secondary data that is falling in line with the theme of the journal. They are brief, yet critical discussions on a specific aspect of the subject concerned. Reviews generally start with the statement of the problem with a brief abstract of 300 words and few key words. Introduction generally brings the issue forward to the readers followed by analytical discussion with the help of necessary tables, graphs, pictures and illustrations wherever necessary. It summarizes the topic with a conclusion. All the statements or observations in the review articles must be based on necessary citations, providing complete reference at the end of the article. Commentaries: Commentaries are opinion articles written mostly by the veteran and experienced writers on a specific development, recent innovation or research findings that fall in line with the theme of the journal. They are very brief articles with the title and abstract that provides the gist of the topic to be discussed, with few key words. It straight away states the problems and provides a thorough analysis with the help of the illustrations, graphs and tables if necessary. It summarizes the topic with a brief conclusion, citing the references at the end. Case Study: Case studies are accepted with a view to add additional information related to the investigative research that advances in the field of Diabetes. It should add value to the main content/article submitted, by providing key insights about the core area. Cases reports must be brief and follow a clear format such as Cases and Methods Section (That describe the nature of the clinical issue and the methodology adopt to address it), discussion section that analyzes the case and a Conclusion section that sums up the entire case. Editorials: Editorials are concise commentaries on a currently published article/issue on managing Diabetes. Editorial office may approach for any such works and authors must submit it within three weeks from the date of receiving invitation. Clinical Images: Clinical Images are nothing but photographic depictions of Diabetes and it should not exceed more than 5 figures with a description, not exceeding 300 words. Generally no references and citations are required here. If necessary, only three references can be allowed. Do not add separate figure legends to clinical images; the entire clinical image text is the figure legend. Images should be submitted with the manuscript in one of the following formats: .tiff (preferred) or .eps. Letters to the Editor/Concise Communications: Letters to the editor should be limited to commentaries on previous articles published with specific reference to issues and causes related to it. It should be concise, comprehensive and brief reports of cases or research findings. It does not follow a format such as abstract, subheads, or acknowledgments. It is more a response or the opinion of the reader on a particular article published and should reach the editor within 6 months of article publication. This section includes acknowledgment of people, grant details, funds, etc. Note: If an author fails to submit his/her work as per the above instructions, they are pleased to maintain clear titles namely headings, subheadings and respective subtitles. Only published or accepted manuscripts should be included in the reference list. Meetings abstracts, conference talks, or papers that have been submitted but not yet accepted should not be cited. All personal communications should be supported by a letter from the relevant authors. Supplementary Information (for example, figures, tables) referred to an appropriate point in the main text of the paper. Summary diagram/figure included as part of the Supplementary Information (optional). All the Supplementary Information must be supplied as a single PDF file and file size should be within the permitted limits. Images should be maximum of 640 x 480 pixels (9 x 6.8 inches at 72 pixels per inch) in size. Diabetes management will support authors by posting the published version of articles by NIH grant-holders to PubMed Central immediately after publication. Authors opted for subscription mode must sign copyright transfer agreement prior to publication of their article. Publisher reserves the copyright and any extensions or renewals of that term thereof throughout the world, including but not limited to publish, disseminate, transmit, store, translate, distribute, sell, republish and use the contribution and material contained therein in print and electronic form of the journal and in other derivative works, in all languages and any form of media of expression available now or in the future and to license or permit others to do so. Diabetes Management is self-financed and does not receive funding from any institution/government. Hence, the journal operates solely through processing charges received from the authors and some academic/corporate sponsors. Being an Open Access Publisher, journal does not collect subscription charges from readers to enable free online access to the articles. Authors are hence required to pay a fair handling fee for processing their articles. Authors are required to make payment only after their manuscript is accepted for publication.